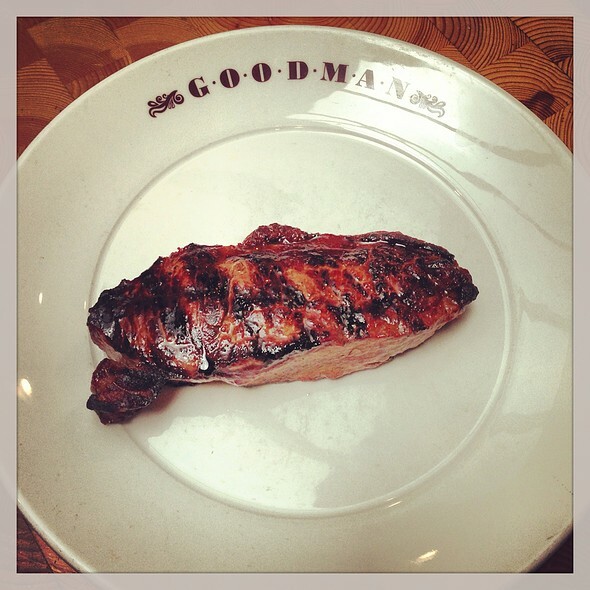 Goodman is a uniquely British interpretation of a New York grill, offering the best beef from both sides of the Atlantic. Most of the meat we serve in our Mayfair restaurant is from Nebraskan USDA corn-fed herds, but we also source many rare breeds from the Lake District, including Belted Galloway, Shorthorn and Longhorn cattle. Our other steaks include grain-fed Australian and Wagyu from Japan and Chile. Every steak on our blackboard has been dry-aged on site – it’s the best way to concentrate flavour – then we cook it over charcoal. To accompany your steak, we’re proud of the American red wine collection we have amassed – we know it’s the best way to complement red meat. 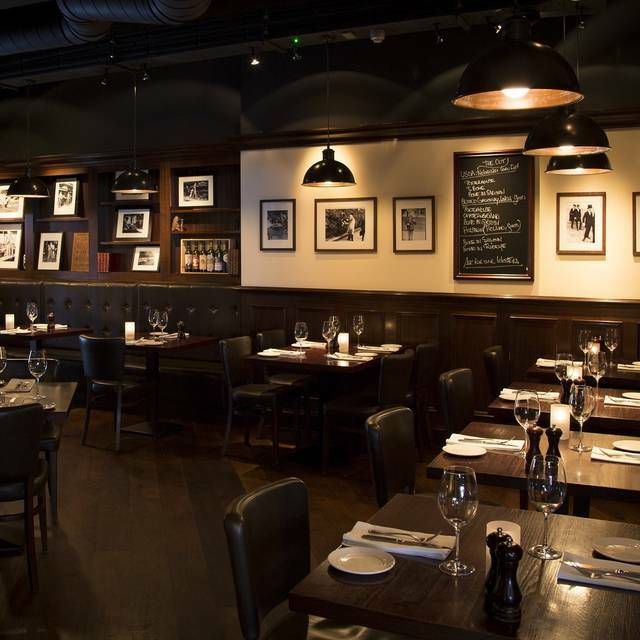 Our Mayfair restaurant is located just off Regent Street. Meat superbly tender and cooked to perfection. We had asked for a quiet table and were indeed shown to a table in what should have been a quiet part of the restaurant. However, the tables near us were exceptionally noisy, which made conversation difficult. We would have been better off in the main part of the restaurant and perhaps the staff should have checked the situation at the time before allocating this particular table to us. Having said that, the food was very nice. The fillet steak was excellent, cooked perfectly (tip from our waitress: if you want medium-rare, ask for it to be cooked rare. It worked!) and the chips were superb. Staff were quite friendly and efficient. Overall a good meal. Shame about the noise. Fantastic food and excellent service. 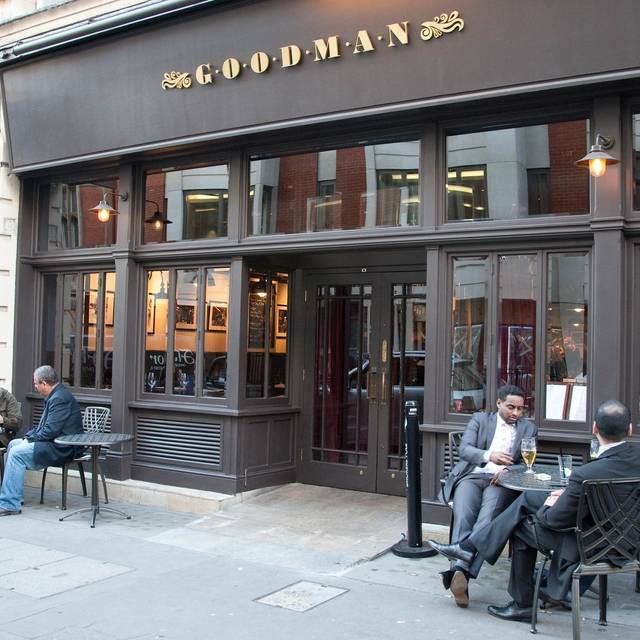 Goodman's is my favourite steak restaurant in London. Good steaks, waitress knowledgeably. Choice of steaks excellent. Shame chocolate dessert mass produced, from order to service too quick to be anything else. Plum sauce, none existent. Tiny thin smear under dessert, therefore totally irrelevant. Never had such a small 175mls wine!!! Would go back, because of steak! Great as usual. Food was tip top and the service was exceptional as always. Never had a bad meal yet. Amazing British meat! Overall the food is very good. 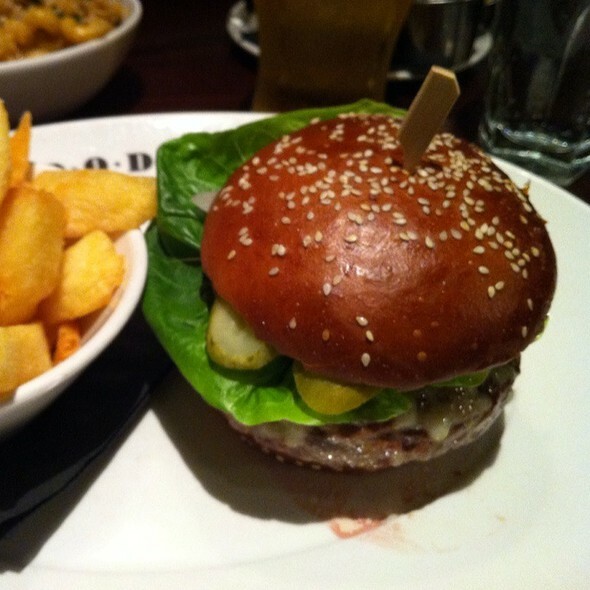 It was my second time at Goodman and I will definately come backa again. I’ve been to Goodman a few times before but this visit was for a friend who wanted to try it out, as she had never visited before. I’ll say this first; the staff were absolutely fantastic. Highly attentive service combined with good humour and knowledgeable about their menu. 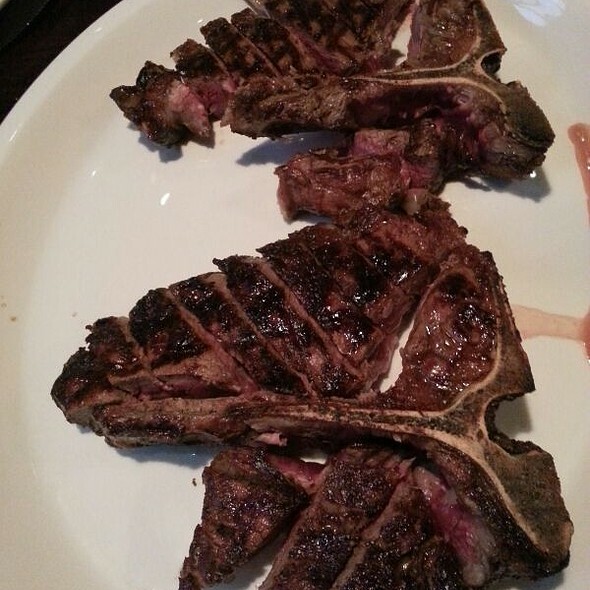 A friend’s fillet was ordered medium-rare and I shared an 800g Porterhouse with another friend. The fillet was absolutely divine, albeit I would say, rare rather than medium rare. The Porterhouse...... well, if I’m completely honest, it was a little bit disappointing. It was ordered medium but would say it arrived as medium-rare and whilst the fillet cut was lovely and melt in the mouth, I felt the sirloin cut was very tough and a little flavourless. Ordinarily, I would have brought this up in the restaurant as I am not shy in coming forward, especially when spending £230 on two courses for three people and a wine from the lower end of a fairly expensive wine list but as it was a belated 50th birthday meal, I felt it not appropriate at the time. Also, I was a little surprised that, because we left some of the sirloin from the Porterhouse cut on the platter, we were not asked if there was a problem when the waitress collected the plates. I would have expected that of a restaurant like Goodman. All in all though, we had a nice evening and the atmosphere was good but I left feeling a little bit disappointed, which is a shame. Everything I hoped for .. Was highly recommended by friends and it did not disappoint . Martini's to start , some outstanding reds from a very comprehensive wine list. Excellent perfectly cooked steaks and sides . Finally a measure of PAPPY VAN WINKLE’S FAMILY RESERVE 23 YEAR BOURBON .. Expensive afternoon .... but worth it .. We also kept the staff very entertained ... Will visit again soon. Very nice dinner, the steak was perfect, we didn’t have starters as it would we very filling. I loved the truffle chips. However, there was a considerable amount of fat on my steak which was too tough to cut through. Dinner for 4 with 2 very fussy eaters - a difficult challenge! One of the fussy eater couldn’t find a starter on the menu to her taste, but the kitchen made some garlic bread and helped her with her medium fillet selection. The other hard to please customer had beef carpaccio, which she found acceptable (I thought it was pretty good actually) followed by another medium Fillet . The rest of enjoyed our Wagyu beef and buratta starters followed by a delicious, flavoursome medium-rare steak! All washed down with a couple of bottles of fabulous Margaux! The atmosphere was very pleasant the restaurant is nicely done the meat was exceptional cooked just the right way the service super good! I would recommend it without hesitation! We even had a tour of the kitchen which was very impressive!!! Best rib eye steak and triple cut chips ever and great service. Excellent steak and service as usual. Probably the best overall high end steak place in London. Table of 4 given for party of 5. Made it uncomfortable. Called and asked if 5 was possible after initial booking of 4. They said yes but accommodated in a way that wasn't really good enough. Very efficient service and beautiful food the steaks were cooked to perfection and the sides were plentiful. The aged beef are to salty. The Steaks were better 2 months ago. There is no more unique taste that was associated with the food from Goodman. Really good service and nice steak. It was my second visit to Goodmans and it will not be my last. Food, service and wine is worth recommending. Was not happy that staff started piling up chairs before closing time and same was not in good taste ! Good steakhouse to go to while shopping. Great location and excellent service. Steak and sides were very good as well as dessert - creme brûlée very good! Truly sensational Food. 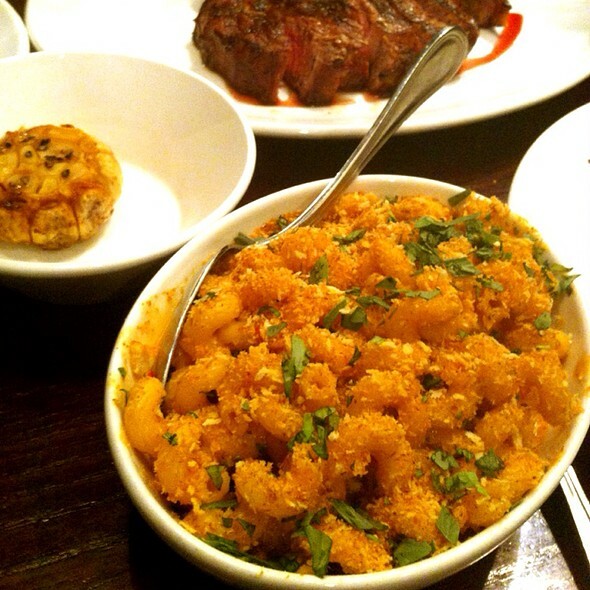 Steaks cooked to perfection served with a delightful selection of side dishes. 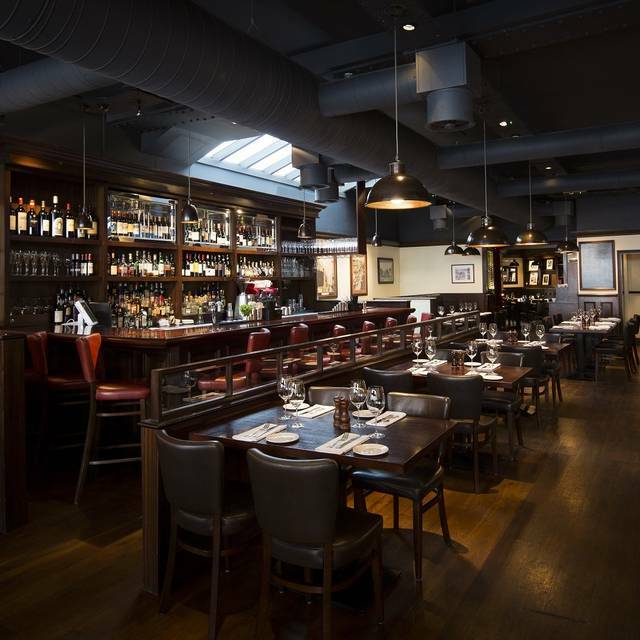 A cosy, and charming setting that takes you to NY's finest steak houses. I go to Goodman 3-4 times a Year. Sometimes I find it the best place where you can have a steak in London, sometimes not so much. This last time the meat was exceptional. I will probably go again in the next two weeks. Always excellent service and steaks here best in London. All types of steak are really really delicious and worth more than their price. Lobster Bisque is one of the best soups I have had. The english breakfast tea is far too plain though. Great delicious food. Had the fillet steak, paired with a nice red wine. If you like steak I'd happily recommend this place and would visit again. 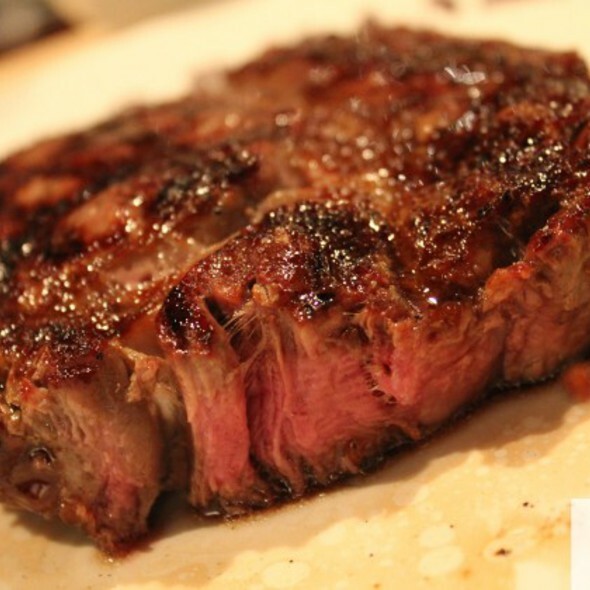 Steak - best I've ever had, just melt in your mouth, bursting with flavour! Alternatives - vegetarian and fish options. We ordered the fish (seed crusted cod with seasonal veggies) and it was great, not just an afterthought to the steak menu. service - welcoming and friendly.